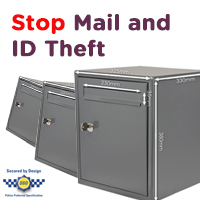 Blog › Do you need a Secured by Design Letterbox to stop mail and ID theft? Our model DAD009 is the UK’s first Secured By Design (SBD) Letterbox, which focuses on crime prevention. We are proud to provide the UK with an official accredited Secured By Design letterbox, a police preferred specification. The Secured By Design letterbox is ideal for both residential homes and commercial premises, as its simple objective is to reduce burglary and crime. Considering 80% of burglaries are committed through front doors, having your post delivered into a secure box, rather than through your letterplate will help prevent you from possible crimes such as arson attacks, lock manipulation and car theft, via your keys being stolen. However amongst these crimes, you may have heard in the news how regular mail theft takes place, which leads to thieves attempting or unfortunately managing to steal a persons identity. We can help ensure this doesn't happen to you, if you make the change today! Or perhaps you're simply tired of the noise your traditional letterplate lets in, or the household heat which you lose through it daily? Our Secured By Design letterbox is manufactured from electro-galvanised steel and can be surface mounted, recessed or freestanding depending on your property and preference. With its 10 Year guarantee, secure locking mechanism, patented anti fishing device and many more special features, you'll wonder how you ever managed without knowing your mail is safe from vandalism and crime everyday. A unique key number is provided with every SBD letterbox, to ensure you can safely order a further set of keys if you require them. For dimension details and further information about our Secured By Design letterbox, please take a look through our range. Remember a new Secured By Design letterbox will be a small price to pay against bigger crimes!